Donâ€™t let that cute, little chipmunk with the aviator goggles fool you! Hipmunk is, at last, an air-fare search engine that's elegant, simple and free from the agony of plowing through pages of results that most air fare search engines throw up. Don’t let that cute, little chipmunk with the aviator goggles fool you! Hipmunk is, at last, an air-fare search engine that's elegant, simple and free from the agony of plowing through pages of results that most air fare search engines throw up. If what you want is flight info that's worth your while in relevancy, you'll want Hipmunk. This virtual start up ( just last August) has turned heads and impressed the 225 billion dollar U.S. travel market just as the online travel agency community seems about to cannibalize itself: American Airlines took its inventory off Orbitz, then Expedia dropped American, and Delta starting playing with its inventory carriers. Enter Hipmunk cofounder, Adam Goldstein, who boldly declared to Fast Company magazine , "Our goal is to build the best travel site on the Internet…a site that helps [travelers] find what they want with a minimum of agony." By that he means the best meta-search website that provides value and ease of use to the flying public, a true consumer-friendly, fare searching travel site. Hipmunk doesn't just deliver 50 pages of results in your New York to San Francisco flight search. It delivers results based on what's of value to you, the consumer. It ranks flights in vivid, color-coded fun and easy to read bars on a results page that tells you what it thinks is the best flight for you in terms of price, flight duration, stops… assuming, correctly that the cheapest flight may not be your best choice. So what is the single factor that sets Hipmunk apart? Goldstein told FTP, “We show the most relevant results visually on a single page”… and more importantly, perhaps, Goldstein said his customers love the site’s “agony sort,” where he helps flyers find the most compatible flight. So, Hipmunk may not display that trip. In fact, Hipmunk offers several tips: Tip 4 is "Drag the black triangle to hide the trips you don't want." And I'm not alone, I'm sure, in wondering why Orbitz has that tiny box on the bottom of the page asking users to check if they'd prefer a non-stop flight. So Goldstein is "right on" when he asks why isn't that box simply checked by default? Himpunk also takes a smart risk when it opts not to show results no sane traveler would choose. Why post a six-hour flight from NY to LA when there's a five-hour flight for the same cost flying the same route? The site is fun and easy to play with, with its bold color-coded time and cost bars… and the investors and the public are responding with big bucks and applause. As O'Brien notes, "toggling from Expedia to Hipmunk is like going from a mosh pit to a symphony hall." 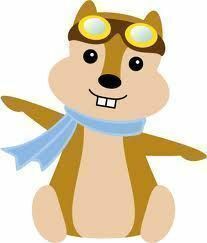 Hipmunk has just launched its iPhone mobile app, and that cute chipmunk is kinda cool!